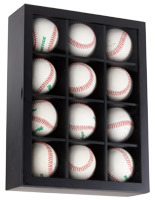 These Trophy Case Shadowboxes Are Great Dimentional Display Frame Enclosures! These Glass Front Cases Are Stylish and Coordinate With Any Collection! 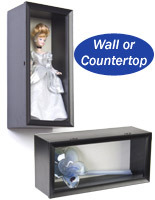 Three-dimensional displays are easy in this 1/2" deep 8-3/8" w x 19-3/8" h showcase. Glass front wooden cabinet has a modern black finish that provides high contrast in any environment. Includes hanging hooks for wall-mounting in either portrait or landscape orientation. 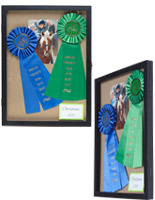 These trophy case shadowboxes are perfect for holding multi media displays as they measure 8-3/8" x 19-3/8" x 1/2" deep. These display frames combine a bold black frame with a neutral linen foam backing board for high visual contrast that will complement any environment. These wall mount showcases, eye-catching trophy case shadowboxes have pre-attached hooks for wall mounting in either portrait or landscape orientation as desired. 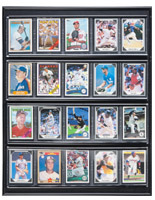 Each of these black frame glass front cabinets is ideal for creating unique dimentional displays of memorabilia and collectibles and includes (8) pushpins. These bold black frame trophy case shadowboxes, also known as memento holders, are designed to show photos, medals, awards, found objects, treasured mementos and make them easy to rearrange as needed.